Every diver has heard of it: rebreathers or closed circuit. Some divers tried a rebreather and some divers even own a rebreather. But: what is a rebreather and which advantages and disadvantages does it bring an open circuit diver? A rebreather is the opposite of open circuit. Open circuit is the normal way of diving: the diver inhales gas (mostly air) form a tank through a regulator (which consists of a first and a second stage). The diver exhales through the mouthpiece of the second stage and the exhaled gas disappears in the environment (water). The exhaled gas still contains oxygen. When a person inhales air, which consists of 21% oxygen and 79% nitrogen, he exhales 16% oxygen (O2), 79% nitrogen (N) and 5% carbon dioxide (CO2). The O2 is needed in his body to create energy. The CO2 is a waste product of the process of making energy. The body doesn’t use the N. Gasses which aren’t used by the body are called inert gasses. One could say that it is a waste to blow the oxygen into the water. With a closed system or rebreather the exhaled oxygen is recollected and used again. The CO2 is filtered by the so-called “scrubber”. The scrubber consists of a chemical substance (in the form of granules), which binds the CO2. In that way all of the CO2 is filtered out of the exhaled gas and only the O2 and N remain. But at some point the filter is saturated and the filtering capacity drops to zero. Most rebreathers have a filter duration of three hours. The diver can use the remaining O2 again. But obviously there is not enough O2 left. The diver needs to add a small amount of O2 to get a “breathable” gas again. A normal diver with a normal exercise level needs one to two liter O2 per minute. That amount of O2 is needed to give enough energy to swim and work, regardless of the depth. So: a three liter tank filled at 200 bar with oxygen is enough for 300-600 minutes of diving! We already got two important parts of a rebreather: a way of adding O2 into the closed loop of the rebreather and a filter to get rid of the CO2. Another important part are the lungs. Most of the rebreathers have two lungs: one for inhaling the gas and one for exhaling the gas. A few rebreathers have one lung. They are needed to mix the oxygen with a diluent gas or make-up-gas when the diver wants to dive deeper than 6 meters. Diving on pure O2 has a depth limit of 6 meters. The lungs are also needed to give volume to the breathing loop. If there were only the canister and some hoses, it would be impossible to breathe in and out. The mouthpiece, also called the Dive Surface Valve (DSV) is standard part of every rebreather. This DSV must be able to close the loop completely, also when the DSV is not in the mouth of the diver: on the surface and under water. A rebreather MUST always know what is the Partial Pressure of Oxygen (PPO2) of the gas he is breathing. The PPO2 may never be higher than 1.6 ata. When it is higher, oxygen becomes toxic and can cause severe convulsion, which leads to drowning. A monitoring device, which measures the loop contents, is highly advisable and standard on most rebreathers. Many rebreathers have also a second back up monitor. This can be in the form of a second wrist display or a Head Up Display (HUD). The monitoring devices sometimes have an integrated diving computer, which calculates the diving profile bases on the contents of the breathing loop. Figure 1 on the bottom of this pages shows the schematic layout of an Apocalypse manual rebreather. Click on the picture for an enlargement. There are five different types of rebreathers. First of all there is the pure O2 rebreather. This rebreather is not used for recreational diving: a recreational diver wants to go deeper than 6 meters. One has also maximum 45 minutes dive time at 6 meters. Because after 45 minutes at 6 meters the central nervous system gets poisoned by the oxygen. The so-called CNS poisoning has reached 100% after 45 minutes. This type of rebreather is mostly used by the military. Example: LAR V from Draeger. An ASCR uses one gas: nitrox. The nitrox flows into the loop with a constant flow. The flow is based on the percentage of O2 in the nitrox mix. We already mentioned that a diver uses approximately 2 liters of O2 per minute. The flow must be high enough to deliver 2 liters O2 per minute to the diver. When the O2 percentage in the gas is high, the flow can be lower. ASCR’s are 5 times more efficient than open circuit. Because ASCR’s use nitrox as a gas, the maximum depth is often limited to 40 meters. The ASCR is a simple rebreather and very suitable for recreational diving. Examples: Azimuth and Draeger Dolphin. A PSCR uses also one gas, like the ASCR. But it is possible to use more gasses. The divers must manually switch gasses, depending on the depth. A PSCR only gives gas to the diver when the diver inhales. The lungs of the PASCR are usually inside a tube on the back of the diver. This process makes a PSCR more efficient than an ASCR: it is 7-8 times more efficient than open circuit. This type of rebreather is very popular amongst cave divers. It is the only type of rebreather, which is approved by GUE. The RB80 is the “mother” of all PSCR’s. There are many copies and clones of the RB80 available, like the Habanero and the RON. A PSCR allows deep dives with gas switches and is therefor a technical rebreather. On a mCCR the diver must add manually O2 into the loop. The diver must monitor the PPO2 in the loop and add sufficient O2 to keep a breathable gas. Most mCCR’s have a small continuous flow of 100% oxygen into the loop (0.7 liter per minute). The idea behind it is that the loop never will be out of O2, which avoids the diver to become hypoxic. mCCR’s are popular amongst cave divers, because mCCR’s don’t make extensive use of electronics. mCCR’s have a depth limit of about 80 mtrs. This is because the first stage for O2 injection is not balanced. The maximum depth is therefor limited to the intermediate pressure of the first stage. However a mCCR has been dived to a depth of 210 mtrs. A mCCR is about 25-30 times more efficient than open circuit. Examples: Apocalypse, rEvo III and Submatix. An eCCR constantly measures the PPO2 in the loop and adds automatically O2 (through an electronic solenoid) until a preset setpoint has been reached. When a diver wants to have a PPO2 of for example 1.2 during the dive, the electronics of the eCCR will keep the PPO2 on 1.2. Manual intervention by the diver is not needed anymore. An eCCR is about 25-30 times more efficient than open circuit. eCCR’s are used for (extreme) deep diving. eCCR’s have been dived to 280 mtrs. The eCCR is the choice of many technical divers. Examples: Inspiration Vision, Evolution, Megalodon, Sentinel, Ouroboros, rEvo III and JJ-CCR. Rebreather training is offered at three levels: air diluent (40 mtrs, no decompression), normoxic trimix diluent (60 mtrs, decompression) and hypoxic trimix diluent (100 mtrs, decompression). 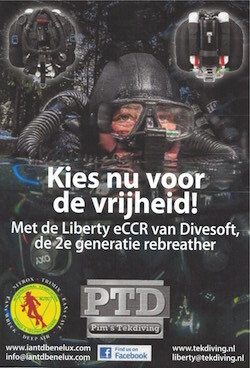 Some agencies such as DIRrebreather and IANTD offer deeper training. PADI has introduced recreational rebreather programs. A basic training typically consists of theory classes, a theory exam, a workshop for the specific rebreather, confined water sessions and 6 to 8 open water dives. Training is focused on buoyancy, equipment handling and emergency scenarios. To get certification the diver must buy the rebreather. When a diver wants to change rebreather, some training agencies offer cross over programs to another rebreather. Rebreathers don’t produce bubbles. Rebreathers need much less breathing gas. That becomes very obvious when making technical trimix dives. The gas bill is much lower. Because of the constant PPO2 and/or the use of nitrox, the use of rebreathers, generate less decompression obligations. The CO2 filtering process generates heat and moist: the rebreather diver inhales a warm and moist gas. This reduces the risk of decompression illness and hypothermia. Rebreathers require more training and dedication than open circuit. Rebreathers can kill when a diver is careless. Rebreathers, especially the electronic rebreathers, can fail. Rebreathers cost a lot of money. Rebreathers require much maintenance. The scrubber, when in contact with water, can cause a deadly caustic cocktail. One can, depending on the rebreather, buy a lot of “add-ons” or options. A very common option is the BOV: Bail Out Valve. This is a mouthpiece with an integrated second stage regulator. The diver can switch between closed circuit and open circuit without removing the mouthpiece. Another option is the so-called tem-stick. This device measures the temperature of the scrubber. It indicates whether the scrubber is still active as a CO2 filter. Different tank mounting devices are sold to enable bigger tanks to be mounted on the rebreather. Well: a rebreather brings some big advantages. But also disadvantages. It is up to the diver to decide whether investing time and money into in rebreather is worthwhile. And he should make a choice for the type of rebreather. He should ask himself questions like: what kind of dives I want to make?, what is my budget?, how much time do I have for training?, etcetera. A good rebreather instructor with experience on several rebreathers can help the diver to make the right choice. It is always a good idea to make a trial dive. But don’t be disappointed on your first rebreather dive: as an open circuit diver you will have to learn to dive in a different way.